The Sleep of Reason Produces Monsters (Spanish: El sueño de la razón produce monstruos) is an etching made by the Spanish painter and printmaker Francisco Goya. Created between 1797 and 1799, it is plate 43 of the 80 etchings making up the suite of satires Los Caprichos. A man, generally held to be Goya himself, seated by the side of a table has fallen asleep. His head is resting on the table. Around him hover bats and owls, one of which offers the sleeper a pencil. By the chair is a cat. All three nocturnal animals. On the side of the table on which his head is resting, is written the print's title. 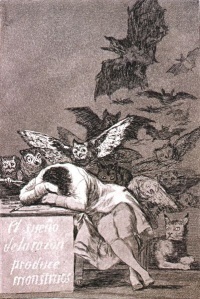 The Metropolitan Museum of Art describes the work with the following words: "In the etching that might have served as the frontispiece to his suite of satires, Los Caprichos, Goya imagined himself asleep amid his drawing tools, his reason dulled by sleep and bedeviled by creatures that prowl in the dark. The artist's nightmare reflected his view of Spanish society, which he portrayed as demented, corrupt, and ripe for ridicule." The image's title is difficult to interpret since the Spanish word sueño means both sleep and dream. The viewer might read this as a portrayal of what emerges when reason is suppressed and, therefore, as an espousal of Enlightenment ideals. However, it also can be interpreted as Goya's commitment to the creative process and the Romantic spirit—the unleashing of imagination, emotions, and even nightmares. Arguably the most famous plate of the series, it has gone on to become an iconic image, with its title often being quoted from Goya. When Goya observed that ‘Imagination, deserted by reason, begets impossible monsters. United with reason, she is the mother of all arts, and the source of their wonders’, he appears to have been influenced by the work of Joseph Addison, which was being translated into Spanish during this period. In his essay ‘Pleasures of Imagination’ Addison stated that ‘when the brain is hurt by an accident, or the mind disordered by dreams or sickness, the fancy is overrun with wild, dismal ideas and terrified with a thousand hideous monsters of its own framing’. The essay was translated by Goya's friend José Luis Munárriz. Unless indicated otherwise, the text in this article is either based on Wikipedia article "The Sleep of Reason Produces Monsters" or another language Wikipedia page thereof used under the terms of the GNU Free Documentation License; or on original research by Jahsonic and friends. See Art and Popular Culture's copyright notice. This page was last modified 20:35, 16 June 2014.